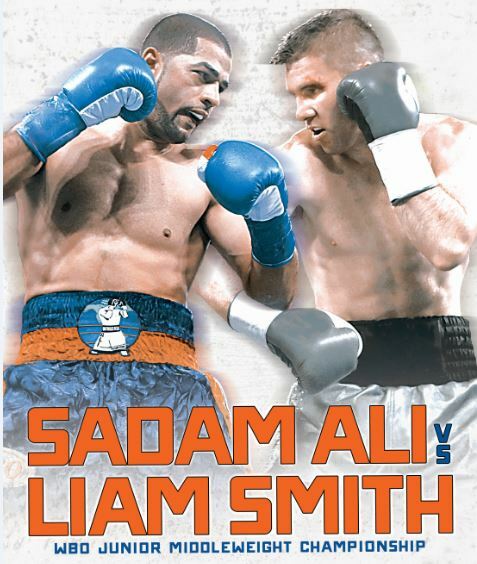 Sadam "World Kid" Ali (26-1, 14 KOs) will defend his WBO Junior Middleweight World Championship against hard-hitting former world champion and No.1 contender Liam “Beefy” Smith (26-1-1, 14 KOs) in a 12-round main event at Turning Stone Resort Casino in Verona, N.Y. The event will take place Saturday, May 12 and will be televised live on HBO World Championship Boxing beginning at 10:00 p.m. ET/PT. Ali, a 2008 U.S. Olympian, has always displayed the skills of a future world champion. The 29-year-old pride of Brooklyn, N.Y. held multiple regional titles and scored important wins against the likes of Francisco “Chia” Santana, Luis Carlos “El Potro” Abregu and former interim WBA World Super Lightweight Champion Johan “El Terrible” Perez. Though suffering a setback in a welterweight title fight against Jessie Vargas, Ali silenced his doubters by moving up to 154 pounds to defeat future Hall of Famer Miguel Cotto in Dec. 2017. The newly-crowned WBO Junior Middleweight Champion will face a tough challenge in Smith, a former holder the same 154-pound title. Smith, the first of an impressive stable of brothers to win a world title, is a 29-year-old native of Liverpool, England. After scoring 20 impressive victories as a professional, Smith defeated John “Apollo Kidd” Thompson via seventh-round technical knockout to capture the WBO 154-pound title that Ali currently holds. Smith then faced Canelo Alvarez in front of over 50,000 fans at AT&T Stadium in Arlington, Texas. Smith lost the title in an impressive show of heart and determination, and after three consecutive victories, he is ready to regain the title that was once his. Ali vs. Smith is a 12-round fight for the WBO Junior Middleweight Championship presented by Golden Boy Promotions in association with Frank Warren. The event is sponsored by Tecate, "THE OFFICIAL BEER OF BOXING" and Casa Mexico Tequila. The fight will take place Saturday, May 12, 2018 at Turning Stone Resort Casino in Verona, New York and will be televised live on HBO World Championship Boxing beginning at 10:00 p.m. ET/PT. Host of the May 12 event, Turning Stone Resort Casino is a Forbes Four-Star Award-winning destination resort, which continues to distinguish itself as a premier venue for fight-of-the-year level boxing. The May event will mark Turning Stone’s 25th nationally-televised boxing event, cementing the resort as a leading destination for nationally-televised combat sports. Turning Stone features world-class amenities including four hotels, more than 20 signature restaurants and dining options, two spas, an all-new 125,000 square foot Las Vegas style gaming floor, a cabaret-style Showroom, a 5,000-seat arena, five golf courses, several bars, cocktail lounges and nightlife venues with live entertainment every weekend. Tickets for this highly anticipated matchup go on sale Tuesday, March 20 at 10:00 am ET and are available from $95 and $75 for ringside seats and all others priced at $55 and $45, plus any applicable fees. Tickets can be purchased at the Turning Stone Resort Box Office in person or by calling 315-361-7469 or online at Ticketmaster (www.ticketmaster.com).